nothing more than artificial cream cheese frosting. It was a unpleasant surprise, one that left me feeling cheated. 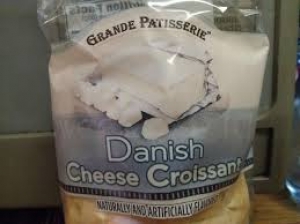 But this Danish Cheese is made with real cream cheese. I was biting into a square of sugar. Then after that I was met by the cream cheese filling that was also sweet but not so much that I was frowning. is so high but I was surprised by the amount of sugar that is actually in this. I would think it would have more than just nine grams. It probably explained the reason I could get away with eating this cream Danish and not need to chug down any water. After tasting and experiencing this cream Danish, I’m certain that I will look to buy this brand in the future. I will also look to try other pastries from Grande Patisserie Danish Cheese Croissant too. I would happily recommend this to a friend. I am sorry but I am not sure what samples you have tried, these are available in my office and I have tried them 3 times. No more. They are all bread, no cheese, not worth the time. No more for me.